I went in for my last ultrasound with my RE this morning before I graduate to my OB, and just as I feared the second I heard one of the babies was measuring 2 days behind at my first ultrasound, we only had one heartbeat today. I'm not sure if it definitely was the one that measured smaller on the first ultrasound, but that seems to make the most sense. So it measured 6w1d last week, which the internet tells me is about 4.5mm, when it should have been about 6.4mm, which is what it was this week (10 days later). My guess is it stopped growing sometime towards the end of last week, based on the time it would likely have taken to grow to 6.4mm and then a little beyond, since my understanding from my first miscarriage is that the baby will usually atrophy and shrink down again once the heart stops beating. I guess the medical term for this situation is Vanishing Twin Syndrome, since the other baby will keep my hormone levels up so everything isn't shed out of me. Instead, we will just wait for it to... vanish. My RE thought it should be reabsorbed back into my body by time I'm out of first trimester, so he also referred me to a high-risk doctor to monitor things to make sure the viable baby isn't threatened while the other one is reabsorbed. I have my first appointment with my new OB on 11/30, and then go to the high-risk doctor on 12/1. At this point, I'm planning to go to the OB until the second baby is reabsorbed, and then I'll transfer back to the midwives I normally see. I got the distinct impression the high-risk doctor will not work with midwives (since they told me that they wouldn't see me until I had an OB selected, since they needed to coordinate with the delivering doctor - which I find odd, since the midwives have hospital privileges to... deliver babies), so although it's going to stress me out to switch practices, I figure it's easier this way so that the high-risk doctor and OB will coordinate with each other until I don't need to be seen by the high-risk doctor. I'm feeling a strange mix of sadness for the baby we lost, happiness for the baby we still have, and a small amount of relief for the health concerns that I had with carrying and delivering twins. None of these emotions feels especially appropriate on their own, though, and so I landed at just feeling pretty numb today. Since I was kind of expecting this to happen, I didn't even cry when my RE first said there was no heartbeat, which was good, since I wanted to stay present for the rest of the ultrasound rather than just losing it (which I did on the way to work instead). The part that did make me tear up during the ultrasound was actually being able to see the heartbeat of the remaining baby, though. 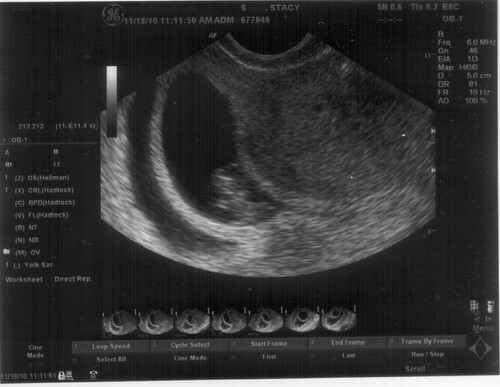 I hadn't been able to make out the heartbeat last week, so it really got to me when my RE went into a closeup and I could actually tell which was the head end of the little lima bean-looking being, and then saw a very noticeable flutter in the middle. All I can hope for is that this one hangs on, and since it measured pretty much right on target at 14.5mm with a strong heartbeat of 164bpm, it looks like we're still in the game. I've been doing my trusty internet research most of the evening, trying to find some reassurance in statistics that just because we lost one of the twins, that we won't lose both. The chances of losing the second one are supposedly quite low - about 5% now (per http://humrep.oxfordjournals.org/content/18/8/1720.full) - and while I know that the statistics won't dictate the outcome of my own situation, I'm trying to keep in mind that the odds are definitely in favor of this one sticking just so I don't get too caught up in thinking about the negatives.